Christopher Oakley has been researching Abraham Lincoln for most of his life. 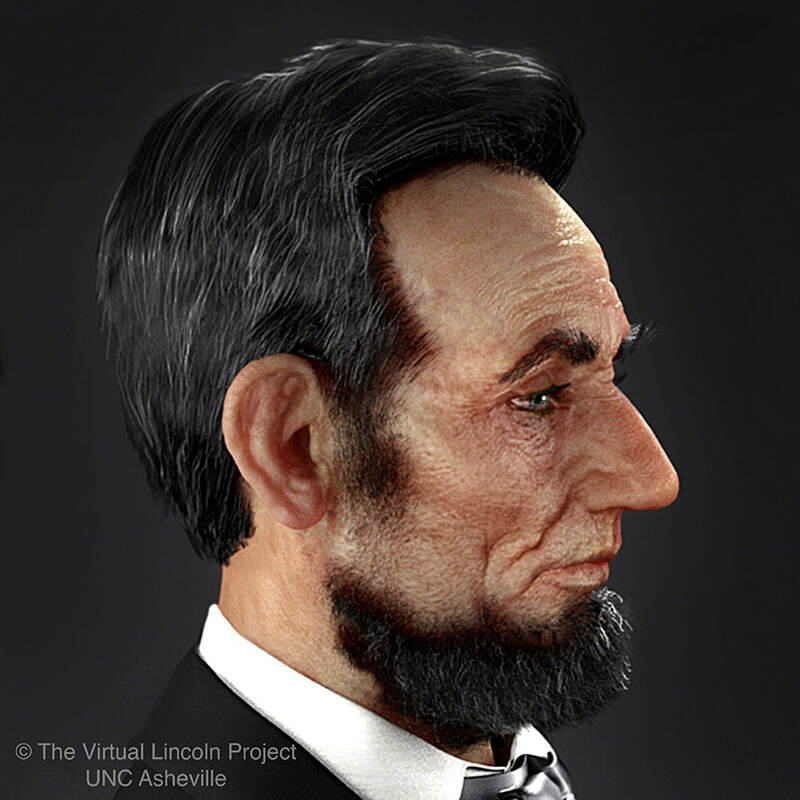 This research led him to launch "The Virtual Lincoln Project," an undergraduate research endeavor, at UNC Asheville. Christopher and his students have been creating a digital, photo-real Abraham Lincoln delivering his Gettysburg Address. 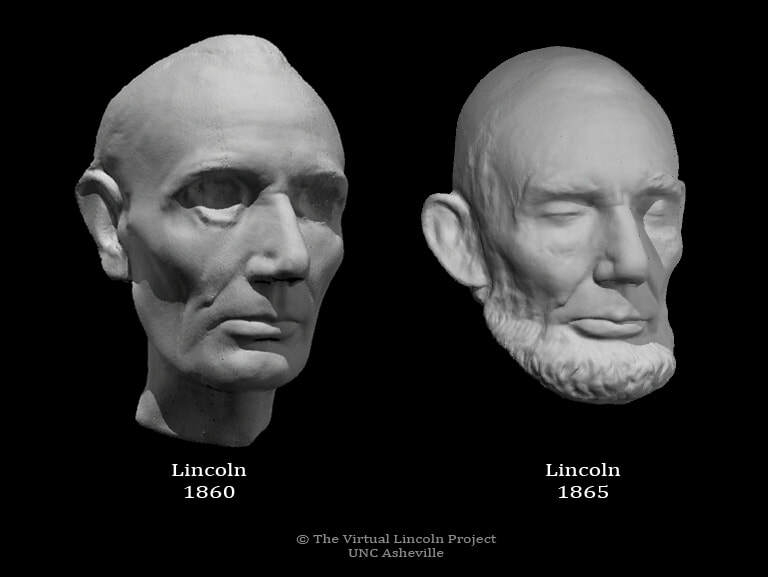 Christopher Oakley combined the digital meshes of the two life cast scans to find something closer to Abraham Lincoln as he appeared in 1863, when he delivered his Gettysburg Address. 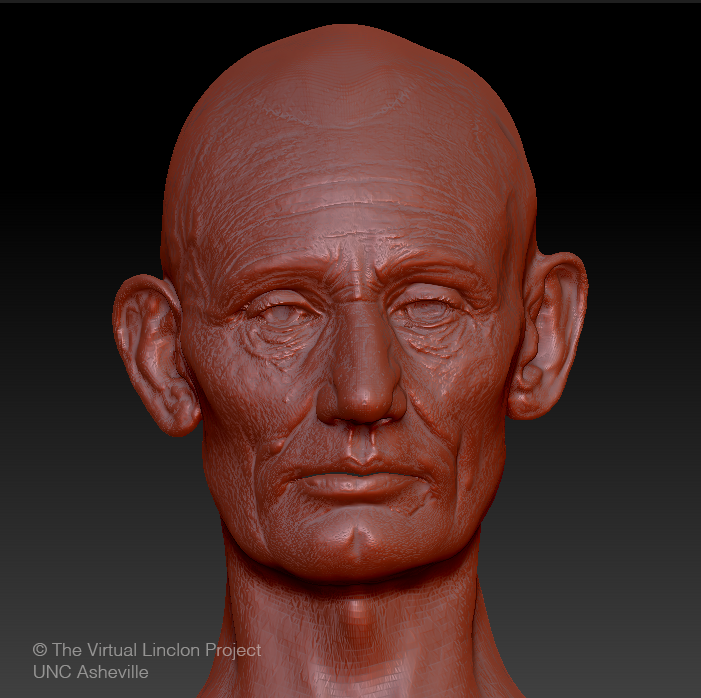 Then he used ZBrush to add details. to ensure accuracy of the model and to place the hair and beard. 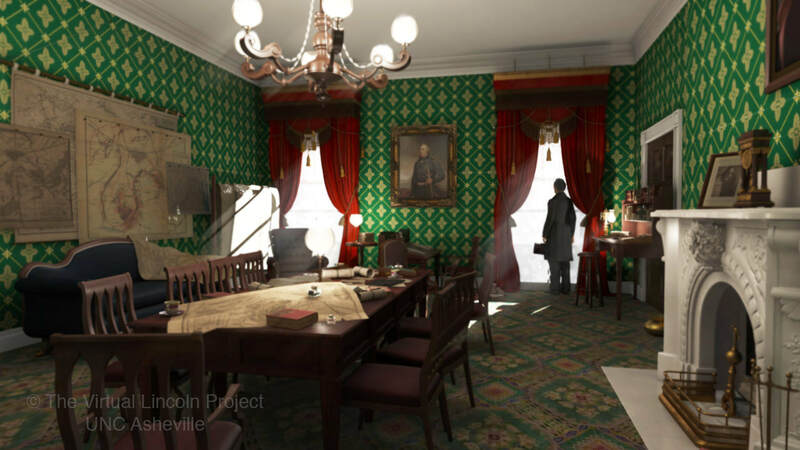 An early rendering of the interior of Lincoln's cabinet room, which he used as his office. We have recreated the room down to the smallest details, based on the notes and sketches of artist Francis B. Carpenter, who studied Lincoln at work for over a month to prepare for his famous painting of Lincoln signing the Emancipation Proclamation. We are currently creating a virtual reality experience using this room. 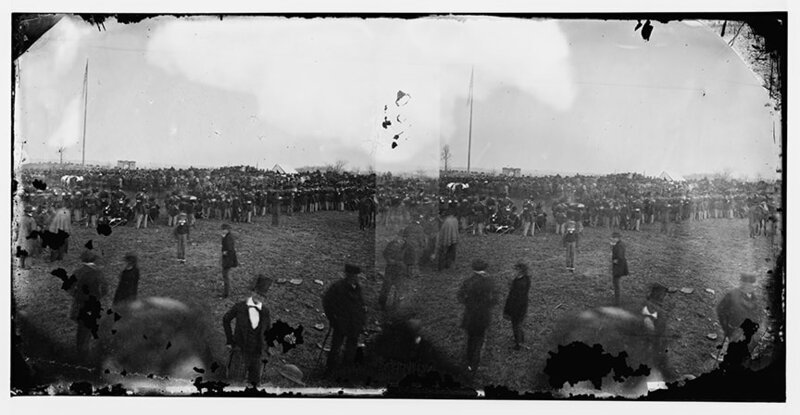 On November 19, 1863, photographer and Lincoln portraitist Alexander Gardner is believed to have taken three stereo photographs of the crowd gathering around the speakers stand at the dedication of the Soldiers National Cemetery in Gettysburg, PA. (The speakers stand is the rise just to the left of the white tent.) While examining high-resolution scans of the photographs on the Library of Congress website, Christopher Oakley began a long process of identifying many of the dignitaries known to have been seated on the speakers stand. 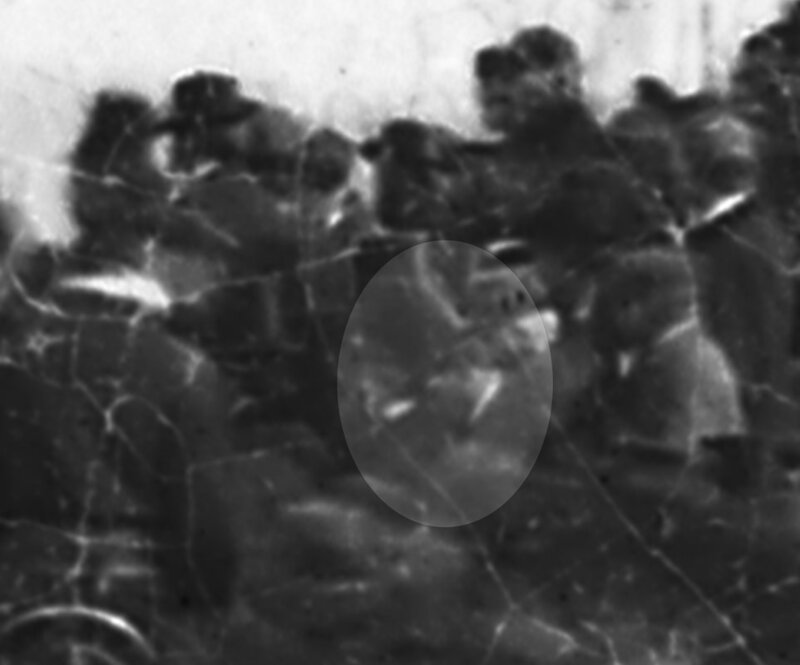 While examining the crowd on the speakers stand Christopher discovered a previously unidentified image of Secretary of State William H. Seward, seated and facing forward (to the left of the photograph). Excited by this discovery, Christopher checked the other two photographs and was able to find Seward in them as well. 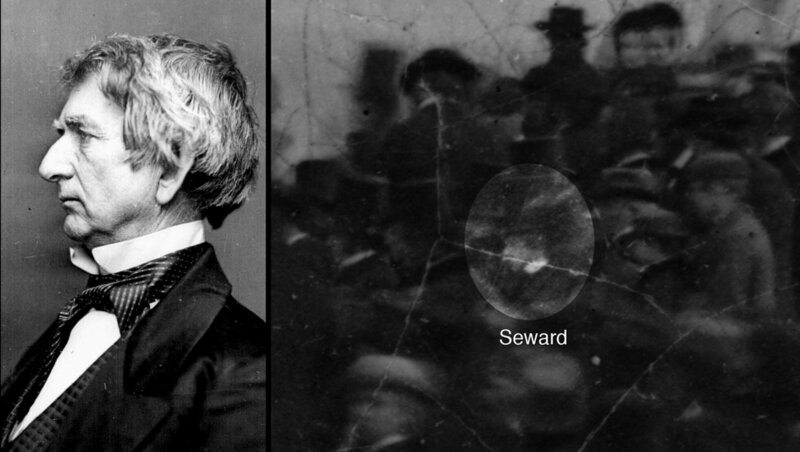 Christopher studied the high-resolution scan of the right side of Gardner's third stereo photograph noticed that a new face was visible next to Seward's. He instantly recognized the profile, but also noted the image was scratched and faded. The left side of the stereo image seemed to be in much better condition. Christopher asked the Library of Congress to scan, in high resolution, the left side of the image, from Gardner's original glass plate. 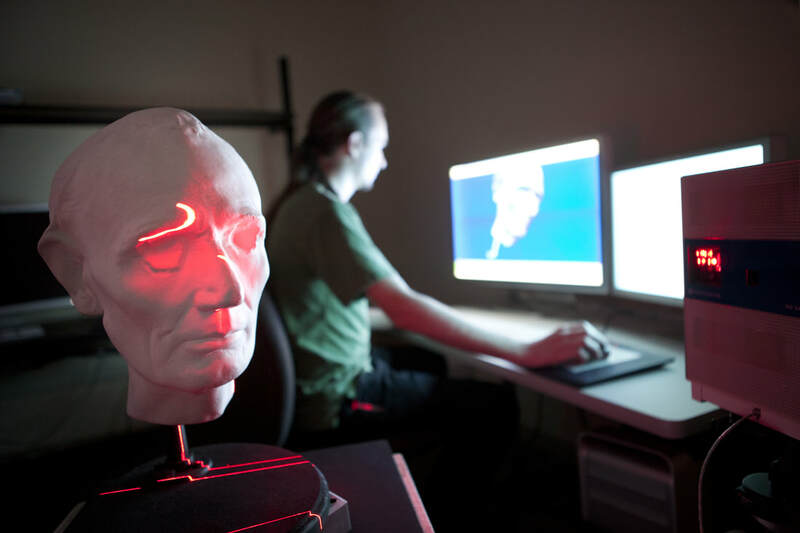 He paid the fee for doing so, and for several months was in sole possession of the high-resolution scan, which Christopher believes reveals the profile of Abraham Lincoln. Seward can be seen just to the left, now looking away from camera. Convinced that this was a new discovery, Christopher consulted top Civil War photography experts and eventually took the news of the discovery to Smithsonian Magazine. 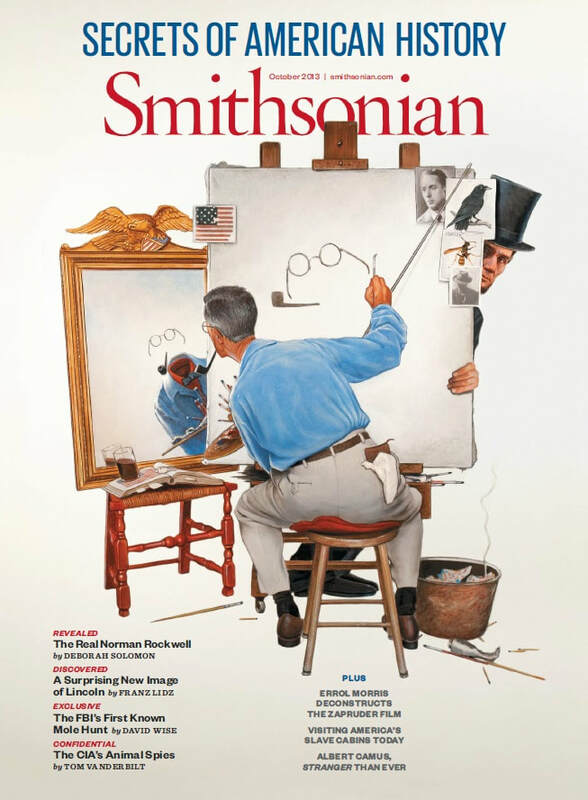 The October 2013 issue of Smithsonian Magazine features a wonderful feature story by Franz Lidz on Christopher's discovery, as well as a narrative of The Virtual Lincoln Project. The story was called "Will the Real Abraham Lincoln Please Stand Up." CBS Evening News sent correspondent Chip Reid and a camera crew from New York to interview Christopher about his discovery and his research and featured the work of the students on The Virtual Lincoln Project. The piece ended up serving as CBS' coverage of the 150th anniversary of the Gettysburg Address.